the plot around special economic zones (sezs) in India thickens with a recent decision of the empowered group of ministers (egom) on sezs to remove a cap of 150 on the number of such zones in the country. The number of sezs will now go up, but only after reviewing the condition of 75 sezs once they become operational, says Pranab Mukherjee, chairperson of egom. At present 28 sezs are functional in the country and about 164 have received in-principle nod. Meanwhile, the Union ministries of finance, and commerce and industry are in conflict. While Union finance minister P Chidambaram has been strongly opposing any relaxation in the number of sezs, Kamal Nath, Union commerce and industry minister, was pitching high for increasing such zones. Chidambaram alleged that sezs would lead to revenue loss of over Rs 100,000 crore as tax sops while Nath claimed sezs would generate Rs 44,000 crore plus employment over the next 10 years. For now, Nath seems to have won the battle but the sez war is far from over. Recently, the Reserve Bank of India, in its annual report for the year ending June 2006, cautioned against disorderly development of sezs that could result in unjustified loss of tax revenue. The sez Rules, 2006, provide single window clearance and give a lot of fiscal incentives. Export units in sezs get 100 per cent tax holiday for 5 years and 50 per cent tax break for five more years; apart from a number of state benefits. There are some minimum area specifications for sezs. A multi-product sez should have a contiguous area of 1,000 hectare (ha) or more, of which at least 35 per cent should be for processing. Specific sector sezs need a minimum area of 100 ha while those exclusively for electronics/it, biotechnology, gems processing require 10 ha. 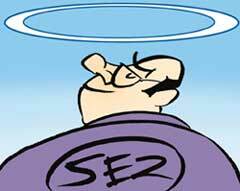 The finance ministry had demanded a minimum area of 25 ha for sezs to check revenue leakages, but the egom rejected it. "These mini-sezs are not going to be enclaves of world class infrastructure. They are simply going to be tax havens. The tax holiday for software and bpo exporters is coming to an end in 2009. Moving into mini-sezs will enable them to extend their tax holiday for another decade. Small sezs in or near existing cities will add to road congestion, power shortages and water shortages," says Swaminathan S Anklesaria Aiyar in an article -- sezs The good, bad and ugly (The Economic Times, August 30, 2006). He says large sezs may be the answer. Economists like Bibek Debroy claim that sezs should belong to a bygone era, unless the government is convinced it will not be able to liberalise across the board. On August 10, the sez rules were amended to disallow existing industrial units to shift to new sezs to plug possible leakages. But there is a possibility of existing units exporting their machinery and importing it back to meet the new unit requirement, warn experts. In Maharashtra, various anti-sez protest groups have formed an sez Virodhi Sangharsh Samiti and demanded repealing of the sez Act, 2005. They claim that almost 75 per cent of land proposed to be acquired for sez projects in Maharashtra is agricultural land. Also there is no cost-benefit analysis of economic losses due to diversion of agricultural land for non-agricultural purposes and the resultant impact on livelihoods. Says Mahesh Pandya of Ahmedabad-based Paryavaran Mitra "sez Act contradicts the environmental impact assessment (eia) notification of 1994 as sezs don't have to conduct eia or public hearing. How do local people intervene?" Adani Group-promoted 10,000 ha-Mundra sez in Kutch district of Gujarat offers a classic example. The Gujarat government has allocated land covering 15 villages, most of which is grazing land, alleges setu, a Mundra-based ngo. Mundra taluka is already short of grazing land. Land allocation is also against the state policy that specifies a minimum of 16 ha per 100 cattle. Over 940 fishing families in that area are set to lose their source of livelihood. sezs have been called real estate havens, as 65 per cent sez land is free for commercial and residential tax-free development. But developers assure that residential flats cannot be sold, but only be leased to the exporting units.